Islamic authorities in Malaysia have seized more than 300 Bibles from the Bible Society because they use the word Allah to refer to God, officials say. Bible Society officials told Reuters that two of their members were briefly detained following the seizure. A court ruled in October that non-Muslims could not use the word Allah to refer to God. The October court ruling overturned a 2009 ruling which said that a Catholic newspaper, The Herald, could use the word Allah in its Malay-language edition to describe the Christian God. Critics accuse the government of tacitly condoning Bible seizures as a way of deflecting anger against Prime Minister Najib Razak's government from poor Malay Muslims who are angry over subsidy cuts likely to force up electricity, petrol and sugar prices. 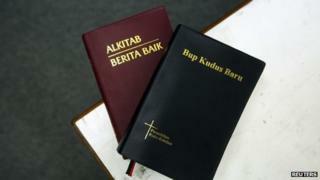 The Malay language Bibles were seized from the Malaysian Bible Society in the state of Selangor near the capital, Kuala Lumpur. "We were told that we were under investigation for breaking a Selangor state law banning non-Muslims from using the word Allah," Bible Society of Malaysia Chairman Lee Min Choon told Reuters. The main political party within Mr Najib's ruling coalition, the United Malays National Organisation (UMNO), said its Selangor members would protest at all churches in the state on Sunday against the unauthorised use of the word Allah. "There are laws in Selangor and there was a decree by his Royal Highness the Sultan. So what they are doing is carrying out the Sultan's decree," Deputy Prime Minister and UMNO Deputy President Muhyiddin Yassin was quoted by media as saying. "They are not doing anything against the law." But in a statement the Council of Churches of Malaysia said it was "alarmed" by the raid and urged the government to "protect religious rights as provided under the Federal Constitution". The 2009 dispute began when the Home Ministry threatened to revoke the publishing permit of The Herald for using the word Allah. Mr Najib's coalition won elections in May, but it was the coalition's worst result in more than half a century in power.